Hookworm infections and tuberculosis (TB) are coendemic in many parts of the world. It has been suggested that infection with helminth parasites could suppress the predominant Th1 (IFN-γ–mediated) response needed to control Mycobacterium tuberculosis infection and enhance susceptibility to infection and/or disease. To determine the role of coincident hookworm infection on responses at steady-state and on M. tuberculosis–specific immune responses in latent TB (LTB), we examined the cellular responses in individuals with LTB with or without concomitant hookworm infection. By analyzing the expression of Th1, Th2, and Th17 subsets of CD4+ T cells, we were able to demonstrate that the presence of coincident hookworm infection significantly diminished both spontaneously expressed and M. tuberculosis–specific mono- and dual-functional Th1 and Th17 cells. Hookworm infection, in contrast, was associated with expanded frequencies of mono- and dual-functional Th2 cells at both steady-state and upon Ag stimulation. This differential induction of CD4+ T cell subsets was abrogated upon mitogen stimulation. Additionally, coincident hookworm infection was associated with increased adaptive T regulatory cells but not natural regulatory T cells in LTB. Finally, the CD4+ T cell cytokine expression pattern was also associated with alterations in the systemic levels of Th1 and Th2 cytokines. Thus, coincident hookworm infection exerts a profound inhibitory effect on protective Th1 and Th17 responses in LTB and may predispose toward the development of active tuberculosis in humans. Soil-transmitted helminths are complex eukaryotic organisms, characterized by their ability to maintain long-standing infections in humans, sometimes lasting decades. Hence, parasitic helminths are a major health care problem worldwide, infecting >2 billion people, mostly in resource-limited countries. Additionally, helminth parasites are often clinically asymptomatic owing in large part to the ability of parasites to manipulate the host immune system to enhance their survival and to restrict local inflammatory pathology (1). Modulation of the host immune response involves a variety of strategies, including induction of regulatory networks and dysregulation of innate and adaptive immune responses (1). The immune downmodulation associated with helminth infections is mostly parasite-Ag specific, but some bystander effects on routine vaccinations, allergic processes, and autoimmune diseases have been noted (2, 3). Helminth infections are known to impair immune responses to oral cholera (4, 5), tetanus toxoid (6, 7), and bacillus Calmette-Guérin vaccinations (8) and to thereby reduce their efficacy in helminth-endemic populations. Hookworm infections are common intestinal helminth infections (affecting 740 million people worldwide) known to cause intestinal injury and blood loss (9). These infections occur throughout the tropics and subtropics and in many regions of the world have an overlapping geographic distribution with Mycobacterium tuberculosis. The control of M. tuberculosis infection requires a clearly delineated Th1 response (IL-12, IFN-γ, and TNF-α) and, to a lesser extent, a Th17 response (IL-17 and IL-23). Both Th1 and Th17 responses have been shown to be important in the induction and maintenance of protective immune responses in mouse models of M. tuberculosis infection or for control of human M. tuberculosis infection (as seen in latent tuberculosis [LTB]) (10–12). During latency, M. tuberculosis is contained within granulomas, where the mycobacteria reside in macrophages and in which growth and replication appear to be constrained. Maintenance of the granulomatous lesion is mediated by CD4+ and CD8+ T cells (13). Mycobacteria-specific T cells mediate delayed-type hypersensitivity reactions to purified protein derivative (PPD), and this reaction (in the absence of demonstrable active infection) is generally considered to indicate LTB (14). More recently, IFN-γ release assays that enable the detection of circulating T lymphocytes responsive to specific M. tuberculosis Ags have been used to detect LTB (15). M. tuberculosis induces prototypical Th1 and Th17 responses in CD4+ and CD8+ T cells both in mouse models and in human infection, in addition to inducing activation of macrophages (with predominant Nos2 production) and both TLR- and Nod-like receptor-mediated NF-κB activation (10–12). Finally, multifunctional CD4+ Th1 cells, coexpressing IFN-γ, TNF-α, and IL-2 and dual-functional cells expressing IFN-γ/IL-2 and IFN-γ/TNF-α have been shown to be associated with protection against active pulmonary disease in tuberculosis (TB) (16–18). Age-specific prevalence studies have indicated that infections with hookworms usually precede the acquisition of tuberculin skin test positivity (19). Thus, in coinfected individuals, hookworm infection often precedes the acquisition of LTB. We hypothesized that immune responses in LTB would be modulated by the regulatory immune networks often seen in chronic helminth infection. To this end, we examined the induction of Th1, Th2, and Th17 responses in LTB individuals with or without active hookworm infections. We observed that the presence of hookworm infection altered profoundly the M. tuberculosis–specific responses in individuals with coincident LTB, specifically by diminishing the frequencies of mono- and dual-functional Th1 and Th17 cells and by expanding Th2 subset differentiation. This alteration in Th cell subset frequencies was reflected in systemic levels of T cell–derived cytokines. We studied a group of 42 individuals with LTB, 21 of whom were positive by stool microscopic examination for hookworm infection in Tamil Nadu, South India (Table I). LTB was diagnosed by a positive IFN-γ release assay, using QuantiFERON-TB Gold In-Tube (Cellestis, Valencia, CA). All subjects had normal chest radiographs. None of the subjects had pulmonary symptoms (cough, fever, chest pain, hemoptysis) nor a positive sputum for M. tuberculosis by smear microscopy and culture. All individuals were examined as part of a clinical protocol approved by Institutional Review Boards of both the National Institute of Allergy and Infectious Diseases and the National Institute for Research in Tuberculosis (NCT00375583), and informed written consent was obtained from all participants. Stool samples were collected, transported to the laboratory at ambient temperatures, and examined by direct microscopy and by formal-gasoline concentration techniques, as described previously (19). Stool microscopy was used to exclude the presence of other intestinal helminths, including Ascaris, Strongyloides, Trichuris, Enterobius, Taenia, and Hymenolepsis. Filarial infection was excluded by the TropBio Og4C3 ELISA (TropBio, Townsville, QLD, Australia). Flow cytometry acquisition was done on BD FACSCanto II (BD Biosciences, San Jose, CA). Analysis was done using FlowJo software v9.4.10 (Tree Star, Ashland, OR). Absolute CD4+ T cell counts were enumerated in whole blood using BD Multitest six-color TBNK mixture (BD Biosciences). Naive and memory T cell phenotyping was performed using FITC-CD45RA (BD Pharmingen/BD Biosciences) and allophycocyanin-CCR7 (eBioscience, San Diego, CA) staining in CD4+ and CD8+ T cells. Naive cells were classified as CD45RA+CCR7+, effector memory cells as CD45RA−CCR7−, and central memory cells as CD45RA−CCR7+. Natural T regulatory cells (nTregs) were classified as CD4+CD25+Foxp3+CD127dim (BD Pharmingen/eBioscience) (see Supplemental Fig. 3 for gating strategy). Mycobacterial Ags—recombinant early secreted Ag (ESAT)-6 and culture filtrate protein (CFP)-10 (Fitzgerald Industries International, Acton, MA)—as well as total CFP from M. tuberculosis H37 Rv (M. tuberculosis CFP) were used as the antigenic stimuli. Final concentrations were 10 μg/ml for ESAT-6/CFP-10 and 10 μg/ml for M. tuberculosis CFP. Phorbol ester (PMA) and ionomycin at concentrations of 12.5 and 125 ng/ml, respectively, were used as the positive control stimuli. Whole blood cell cultures were performed to determine the intracellular levels of cytokines. Briefly, whole blood was diluted 1:1 with RPMI 1640 medium supplemented with penicillin/streptomycin (100 U/100 mg/ml), l-glutamine (2 mM), and HEPES (10 mM) (all from Invitrogen, San Diego, CA) and distributed in 12-well tissue culture plates (Costar/Corning, Corning, NY). The cultures were then stimulated with M. tuberculosis CFP or ESAT-6/CFP-10 or PMA/ionomycin or media alone in the presence of the costimulatory molecules CD49d/CD28 at 37°C for 6 h. FastImmune brefeldin A solution (10 μg/ml) was added after 2 h. After 6 h, centrifugation, washing, and RBC lysis were performed. Cells were fixed using Cytofix/Cytoperm buffer (BD Biosciences) and cryopreserved at −80°C. The cells were thawed, washed, and then stained with surface Abs for 30–60 min. Surface Abs used were CD3 (AmCyan), CD4 (allophycocyanin-H7), and CD8 (PE-Cy7). The cells were washed and permeabilized with BD Perm/Wash buffer (BD Biosciences) and stained with intracellular cytokines for an additional 30 min before washing and acquisition. Cytokine Abs used were IFN-γ, TNF-α, IL-2, IL-4, IL-5, IL-10, IL-13, IL-17A, IL-17F, and IL-22. Eight-color flow cytometry was performed on a FACSCanto II flow cytometer with FACSDiva software v.6 (Becton Dickinson, Cockeysville, MD). Lymphocyte gating was set by forward and side scatter, and 100,000 lymphocyte events were acquired. Gating for CD4+ T cells expressing cytokines was determined by fluorescence minus one. Data were collected and analyzed using FlowJo software (Tree Star, Ashland, OR). All data are depicted as frequency of CD4+ T cells expressing cytokine(s). Baseline values following media stimulation are depicted as baseline frequency, whereas frequencies following stimulation with Ags or PMA/ionomycin are depicted as net frequencies (with baseline values subtracted). The levels of cytokines in plasma were measured using Bio-Plex multiplex cytokine assay system (Bio-Rad). The cytokines analyzed were IL-2, IFN-γ, TNF-α, IL-4, IL-5, and IL-13. Data analyses were performed using GraphPad Prism (GraphPad Software, San Diego, CA). Geometric means (GM) were used for measurements of central tendency. Statistically significant differences between two groups were analyzed using the nonparametric Mann–Whitney U test, and multiple comparisons were corrected using the Holm’s correction. To determine the impact of hookworm infection on the steady-state (or constitutive) Th1, Th2, and Th17 profile of LTB individuals, we cultured whole blood from coinfected hookworm/LTB (HW/LTB) and LTB only individuals with media alone and measured the frequency of CD4+ T cells expressing each of the Th1-, Th2-, and Th17-associated cytokines (Fig. 1A). As shown in Fig 1, the frequencies of CD4+ T cells expressing TNF-α alone or coexpressing TNF-α/IFN-γ, TNF-α/IL-2, IL-17A/IFN-γ, or IL-17A/IL-10 were all significantly reduced in coinfected individuals compared with LTB-infected individuals (Table I). Alternatively, the frequencies of CD4+ T cells expressing IL-5 or IL-13 alone or coexpressing IL-5/IL-13 were significantly increased in coinfected individuals. Also, hookworm infection was associated with constitutively higher frequencies of CD4+ T cells expressing IL-10 (adaptive regulatory T cells [Tregs]) but not nTregs. Therefore, hookworm infection is associated with profound alterations in the repertoire of Th1, Th2, and Th17 subsets at steady-state. Hookworm infection is associated with decreased constitutively expressed frequencies of CD4+ Th1 and Th17 cells and increased frequencies of Th2 cells in LTB. Whole blood was cultured with media alone for 6 h and the baseline frequencies of Th1, Th2, and Th17 cells were determined. (A) Representative whole-blood intracellular cytokine assay flow data from an LTB individual showing expression of Th1, Th2, and Th17 cytokines at baseline. The plots shown are gated on CD3+CD4+ T cells. The baseline frequencies of (B) mono- and (C) dual-functional CD4+ Th1, Th2, and Th17 cells are shown. All individuals were LTB infected with (HW/LTB; n = 21) or without (LTB; n = 21) concomitant hookworm infection. The bars represent GM and 95% confidence intervals. The p values were calculated using the Mann–Whitney test. aTreg, Adaptive Treg; nTreg, natural Treg. To determine whether the altered baseline repertoire of Th1, Th2, and Th17 cells influences the ability of CD4+ T cells to respond to a mitogenic stimulus, we stimulated whole blood from HW/LTB or LTB individuals with PMA/ionomycin for 6 h and measured the frequencies of mono- and multifunctional CD4+ T cells expressing Th1, Th2, and Th17 cytokines (Fig. 2A). As shown in Fig. 2B, the net frequency of monofunctional CD4+ Th1, Th2, and Th17 cells was not significantly increased in coinfected (HW/LTB) individuals compared with LTB-infected individuals. Also as shown in Fig 2C, the frequencies of dual-functional CD4+ T cells expressing different combinations of dual cytokines of the Th1, Th2, and Th17 family were not significantly altered in coinfected individuals. Therefore, hookworm infection modulated the repertoire of CD4+ T cells in LTB but did not impair the ability of these cells to respond appropriately to mitogenic stimulation. Hookworm infection is not associated with alterations in the frequencies of mono- and dual-functional CD4+ Th1, Th2, and Th17 cells upon phorbol ester and ionomycin stimulation. Whole blood was cultured with PMA/ionomycin for 6 h and the net frequencies of CD4+ Th1, Th2, and Th17 cells were determined. (A) Representative whole-blood intracellular cytokine assay flow data from an LTB individual showing expression of Th1, Th2, and Th17 cytokines following PMA/ionomycin stimulation. The plots shown are gated on CD3+CD4+ T cells. (B) Net frequency of CD4+ T cells expressing only monofunctional Th1, Th2, and Th17 cytokines is shown as bar graphs. (C) Net frequency of CD4+ T cells expressing dual-functional Th1, Th2, and Th17 cytokines is shown as bar graphs. The bar represents the GM of the frequency of CD4+ T cells expressing the respective cytokine(s), and the error bar represents the 95% confidence interval in hookworm uninfected (LTB, n = 21) and hookworm-infected (HW/LTB, n = 21) LTB individuals. Net frequencies were calculated by subtracting baseline frequency from the Ag-induced frequency for each individual. The p values were calculated using the Mann–Whitney U test. To determine the impact of coexisting hookworm infection on mycobacterial Ag-specific Th1, Th2, and Th17 responses in LTB, we stimulated whole blood from coinfected or singly infected individuals with mycobacterial Ags ESAT-6/CFP-10 or total CFP for 6 h and measured the frequencies of mono- and dual-functional Th1, Th2, and Th17 cells (Fig. 3A). As shown in Fig 3B, the frequency of CD4+ T cells expressing IL-2, TNF-α, or IL-17A alone was significantly reduced whereas the frequency of CD4+ T cells expressing IL-5 or IL-13 alone was significantly increased following Ag stimulation in HW/LTB individuals compared with those with LTB. Similarly, as shown in Fig. 3C, the frequencies of CD4+ T cells coexpressing IL-2/TNF-α, IFN-γ/TNF-α, IL-17A/IFN-γ, IL-17A/IL-22, and IL-17A/IL-10 were all significantly reduced following ESAT-6/CFP-10 stimulation. In contrast, the frequency of CD4+ T cells coexpressing IL-5/IL-13 (but not IL-4/IL-13) was significantly increased following M. tuberculosis Ag stimulation. Additionally, as shown in Supplemental Figs. 1 and 2, the frequencies of CD4+ T cells expressing IL-2 or TNF-α alone or coexpressing IL-2/TNF-α, IFN-γ/TNF-α, IL-17A/IFN-γ, or IL-17A/IL-10 were significantly reduced following total CFP stimulation. Therefore, hookworm infection profoundly alters the Ag-stimulated Th1 and Th17 responses in LTB. Hookworm infection is associated with decreased Ag-specific frequencies of mono- and dual-functional CD4+ Th1 and Th17 cells and increased frequencies of Th2 cells in LTB. Whole blood was cultured with ESAT-6/CFP-10 for 6 h and the net frequencies of CD4+ Th1, Th2, and Th17 cells were determined. (A) Representative whole-blood intracellular cytokine assay flow data from an LTB individual showing expression of Th1, Th2, and Th17 cytokines following Ag stimulation. The plots shown are gated on CD3+CD4+ T cells. (B) Net frequency of CD4+ T cells expressing only monofunctional Th1, Th2, and Th17 cytokines is shown as bar graphs. (C) Net frequency of CD4+ T cells expressing dual-functional Th1, Th2, and Th17 cytokines is shown as bar graphs. The bar represents the GM of the frequency of CD4+ T cells expressing the respective cytokine(s), and the error bar represents the 95% confidence interval in hookworm-uninfected (LTB, n = 21) and hookworm-infected (HW/LTB, n = 21) LTB individuals. Net frequencies were calculated by subtracting baseline frequency from the Ag-induced frequency for each individual. The p values were calculated using the Mann–Whitney U test. To examine whether alterations in the frequency of CD4+ Th1 and Th2 cells results in alterations in the circulating levels of the prototypical Th1 and Th2 cytokines, we measured the levels of IFN-γ, TNF-α, IL-2, IL-4, IL-5, and IL-13 in the plasma of HW/LTB-coinfected and LTB-infected individuals. As shown in Fig. 4, we observed significantly lower plasma levels of IFN-γ (GM of 873.6 pg/ml in LTB versus 394.8 pg/ml in HW/LTB, p = 0.0009) and TNF-α (GM of 1561 pg/ml in LTB versus 842.1 pg/ml in HW/LTB, p = 0.0053) but not IL-2 in coinfected individuals compared with LTB-infected individuals. We also observed significantly higher levels of IL-5 (GM of 33.0 pg/ml in LTB versus 417.6 pg/ml in HW/LTB, p < 0.0001) and IL-13 (GM of 54.5 pg/ml in LTB versus 477.3 pg/ml in HW/LTB, p < 0.0001) in coinfected individuals compared with LTB-infected individuals. Thus, alterations in CD4+ T cell cytokine expression is reflected in the corresponding changes in systemic levels of Th1 and Th2 cytokines in coinfected individuals. Hookworm infection is associated with alterations in the plasma levels of Th1 and Th2 cytokines in LTB. 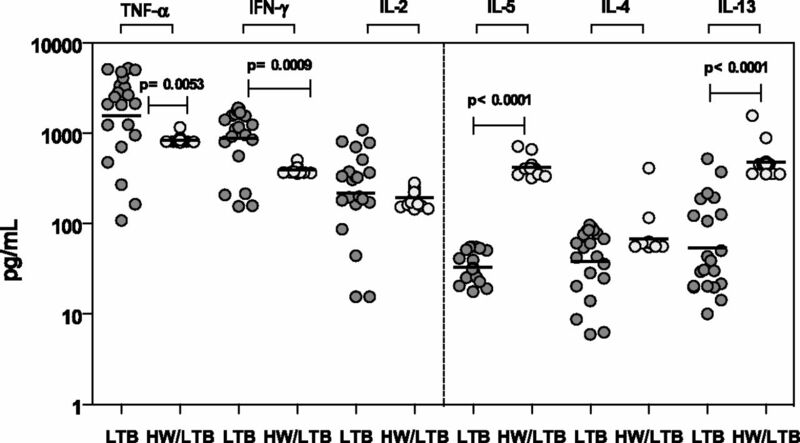 The plasma levels of Th1 (IFN-γ, IL-2, TNF-α) and Th2 (IL-4, IL-5, IL-13) cytokines were measured by ELISA in LTB-infected individuals with (HW/LTB; n = 21) or without (LTB; n = 21) concomitant hookworm infection. The results are shown as scatter plots with each circle representing a single individual. The p values were calculated using the Mann–Whitney U test. A wide variety of studies have been performed to examine the possible effects of helminth infection on the induction of a protective immune response against mycobacteria (20, 21). Both intestinal and systemic helminths have been shown to modulate proliferation and IFN-γ production in response to PPD in helminth/TB-coinfected individuals (20, 21). Some of these defects have been shown to be reversible following antihelminthic chemotherapy (20). We have previously demonstrated that concurrent filarial infection could inhibit the generation of potentially protective Th1 immune responses in LTB-infected individuals (22). In addition to a significant reduction of Th1 responses by PPD-specific T cells in helminth-infected patients, it was shown that IL-23 and IL-17 production in response to both PPD and M. tuberculosis culture filtrate was also significantly lower in filarial-infected LTB individuals when compared with LTB controls without lymphatic filariasis (22). Furthermore, patients coinfected with filaria and M. tuberculosis exhibited a significant reduction of both TLR-2 and TLR-9 expression and in proinflammatory cytokine production and that treatment with antihelminthic drugs restored these responses, suggesting that helminth-induced immunomodulatory effects are transient (23). Intestinal helminth coinfection has also been shown to adversely impact antimycobacterial immune responses (24, 25). Other studies have also demonstrated that intestinal helminth infections may be one of the risk factors for the development of active pulmonary TB (26). Similarly, a recent study found that there was an association between Schistosoma mansoni infection and progression to TB disease in HIV-infected Ugandan individuals (27). Finally, the immunogenicity of bacillus Calmette-Guérin vaccination has been shown to be impaired in helminth-infected individuals, and this is associated with enhanced TGF-β production but not enhanced Th2 responses (24). Apart from human studies, a variety of animal models of coinfection have confirmed the influence of helminth infection on the immune response to TB (21, 28). Thus, although a variety of epidemiological studies have demonstrated potential association between the presence of helminth infections and the susceptibility to TB disease, very few studies have examined the mechanism behind this potential connection. The interplay among different CD4+ T cell effector subsets plays a key role in defining immune responses to pathogens as well as to a variety of inflammatory stimuli and the prevention/development of autoimmunity. Not only do Th1 and Th17 cells play an important role in the establishment/maintenance of a variety of chronic inflammatory and autoimmune disorders, they appear to be critical in mediating resistance to a variety of intracellular infections (29, 30). In M. tuberculosis, for example, Th1 responses are absolutely necessary for inducing resistance, with Th17 responses important in inducing and maintaining memory and recall responses (10). 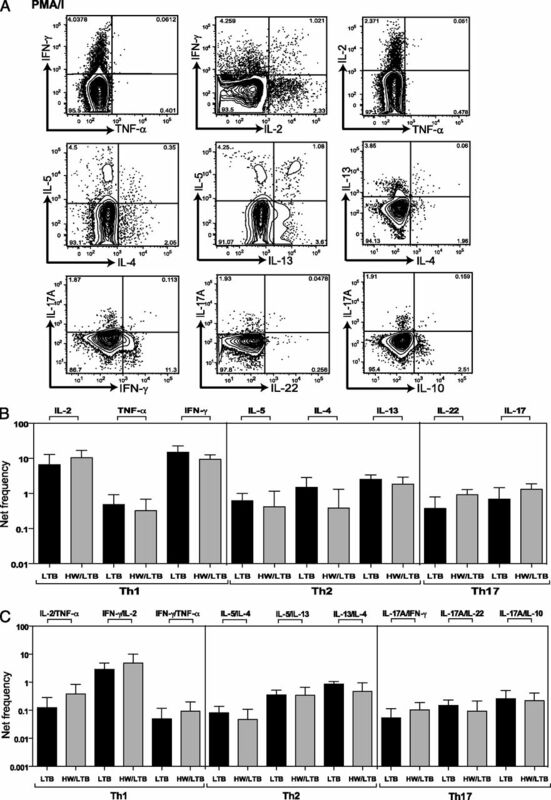 Because immune-mediated protection against M. tuberculosis is characterized by strong Mycobacterium-specific Th1 responses, it has been postulated that coincident infections with helminth parasites could modulate these immune responses by driving Th2 and/or Tregs that induce anti-inflammatory responses (3). However, the effects of coinfection on Ag-specific induction of protective or pathogenic Th1, Th2, and Th17 subsets have not been carefully examined. The examination of constitutive or mitogen-induced immune responses revealed certain interesting differences between hookworm-coinfected or LTB alone–infected individuals. First, the constitutive frequencies of CD4+ cells producing Th1 and Th17 cytokines were significantly downregulated in coinfected individuals. Because TNF-α and IL-17 have been reported to exhibit antimycobacterial activity either in primary or memory responses to infection (31–33), the fact that hookworm coinfection influences the induction of these T cells suggests a potential compromise in antibacterial immunity in the presence of this helminth infection. Second, hookworm infections were also associated with constitutively increased frequency of CD4+ T cells expressing Ag-driven Th2 cells, cells that have been implicated in susceptibility to TB infection because of their potential ability to downmodulate protective Th1 responses (34), to induce alternative activation of macrophages leading to diminished bactericidal responses (35), and to inhibit autophagy, also involved in bacterial killing (36). Thus, the increased frequency of Th2 cells observed in HW/LTB coinfections could potentially serve as another possible mechanism by which there is an increased risk of promoting development of active TB. Third, although hookworm infection was associated with a profound modulation of Th1, Th2, and Th17 baseline repertoires, it did not impair the ability of these CD4+ T cells to respond appropriately to a positive stimulus. Although hookworm infection mediates alterations in the baseline subsets of CD4+ T cells, we were interested in examining the effect of these alterations on mycobacterial Ag–specific responses in these LTB-infected individuals. We primarily focused on the expression of mono- and dual-functional–expressing CD4+ Th1, Th2, and Th17 cells. Whereas the role of CD4+ T cells, IFN-γ, and TNF-α in resistance to TB is well established, the role multifunctional CD4+ T cells is still not clear (37). CD4+ T cells expressing IL-2 alone or those coexpressing IL-2 and IFN-γ or TNF-α and IFN-γ have been show to be potential correlates of protective immunity to M. tuberculosis (18, 38). Similarly, multifunctional CD4+ T cells coexpressing IFN-γ, TNF-α, and IL-2 have also been shown to correlate with immunity to M. tuberculosis in a study comparing smear-positive TB to those with smear-negative TB or LTB (16). Thus, mono- and dual-functional Th1 cells clearly play an important role in susceptibility or resistance to infection and/or disease. Our data in HW/LTB-coinfected individuals suggests that both mono- and dual-functional Ag-specific Th1 and Th17 cells are functionally impaired following Ag stimulation. Therefore, one of the potential mechanisms by which helminth infections impair the ability to respond to M. tuberculosis is by altering the Ag-specific immune responses of Th1, Th2, and Th17 cells, alterations that could have a profoundly detrimental effect by leading to reactivation of TB. Helminth infections establish persistent infections, chronicity that is facilitated by mechanisms that dampen immune responses. The two major mechanisms by which helminth infections can modulate immune responses are by the induction of nTregs and CD4+ T cells expressing IL-10 (adaptive Tregs) (39). Foxp3-expressing T cells are nTregs that play an important role in peripheral tolerance and attenuation of immune responses (40). Foxp3 expression is known to be upregulated in human hookworm infections (41), and CD4+CD25+ T cells are known to mediate suppression, as evidenced by decreased allergic inflammation in an animal model of helminth infection (42, 43). Similarly, IL-10 is known to mediate immune suppression in a variety of helminth infections (44). Hence, we wanted to examine the nature of the cells that might be responsible for this regulation. Interestingly, although we observed no significant differences in the frequency of nTregs, hookworm coinfection was associated with a significantly enhanced frequency of IL-10–expressing CD4+ T cells, suggesting that adaptive Tregs might play the most important role in modulation of the T cell subsets observed in the current study. Additionally, hookworm infections did not modulate the absolute numbers or the frequencies of effector memory T cells in LTB-infected individuals, suggesting that the altered CD4+ T cell repertoire is not due to alterations in T cell numbers or memory subsets. There is a great deal of geographic overlap in the regions of high hookworm endemicity and susceptibility to TB (19). We therefore examined whether established immune responses against a given infection could affect the immune response to a subsequent infection. Our study clearly demonstrates the modulation of immune responses to M. tuberculosis by coincident hookworm infection. Hookworm-induced regulatory networks appear to be associated with a significant bystander/spillover effect on the immune responses against mycobacterial Ags in LTB patients. Our findings may have significant implications for vaccine efficacy in helminth-endemic countries and potentially for understanding how latency in M. tuberculosis is broken. Understanding the pathways that helminth infections use to mediate bystander suppression/modulation to exogenous Ags and infections should enable new strategies to antagonize suppression for controlling deleterious infections and optimal boosting of vaccine efficacy. We thank the field staff at the Epidemiology Unit of the National Institute for Research in Tuberculosis (Tiruvallur, India) for assistance in the conduct of this study. This work was supported by the Intramural Research Program of the Division of Intramural Research, National Institute of Allergy and Infectious Diseases, National Institutes of Health.
. 2003. Immune regulation by helminth parasites: cellular and molecular mechanisms. Nat. Rev. Immunol. 3: 733–744. 2009. Interactions between helminth parasites and allergy. Curr. Opin. Allergy Clin. Immunol. 9: 29–37.
. 2007. Chronic helminth infections induce immunomodulation: consequences and mechanisms. Immunobiology 212: 475–490.
. 2001. Human infection with Ascaris lumbricoides is associated with suppression of the interleukin-2 response to recombinant cholera toxin B subunit following vaccination with the live oral cholera vaccine CVD 103-HgR. Infect. Immun. 69: 1574–1580.
. 2000. Albendazole treatment of children with ascariasis enhances the vibriocidal antibody response to the live attenuated oral cholera vaccine CVD 103-HgR. J. Infect. Dis. 182: 1199–1206.
. 1998. Impaired tetanus-specific cellular and humoral responses following tetanus vaccination in human onchocerciasis: a possible role for interleukin-10. J. Infect. Dis. 178: 1133–1138.
. 2004. Impairment of tetanus-specific cellular and humoral responses following tetanus vaccination in human lymphatic filariasis. Infect. Immun. 72: 2598–2604.
. 2005. Schistosoma mansoni infection reduces the protective efficacy of BCG vaccination against virulent Mycobacterium tuberculosis. Vaccine 23: 1326–1334.
. 2004. Hookworm infection. N. Engl. J. Med. 351: 799–807. 2012. The immunological life cycle of tuberculosis. Nat. Rev. Immunol. 12: 581–591.
. 2011. Immunological biomarkers of tuberculosis. Nat. Rev. Immunol. 11: 343–354. 2006. Tuberculosis: back on the immunologists’ agenda. Immunity 24: 351–357.
. 2011. Clinical application and limitations of interferon-γ release assays for the diagnosis of latent tuberculosis infection. Clin. Infect. Dis. 52: 1031–1037.
. 2011. Dominant TNF-α+ Mycobacterium tuberculosis-specific CD4+ T cell responses discriminate between latent infection and active disease. Nat. Med. 17: 372–376.
. 2007. Dynamic relationship between IFN-gamma and IL-2 profile of Mycobacterium tuberculosis-specific T cells and antigen load. J. Immunol. 178: 5217–5226.
. 2006. Coincident filarial, intestinal helminth, and mycobacterial infection: helminths fail to influence tuberculin reactivity, but BCG influences hookworm prevalence. Am. J. Trop. Med. Hyg. 74: 841–847.
. 2012. Impact of filarial infections on coincident intracellular pathogens: Mycobacterium tuberculosis and Plasmodium falciparum. Curr. Opin. HIV AIDS 7: 231–238.
. 2012. “Coinfection-helminthes and tuberculosis”. Curr. Opin. HIV AIDS 7: 239–244.
. 2009. 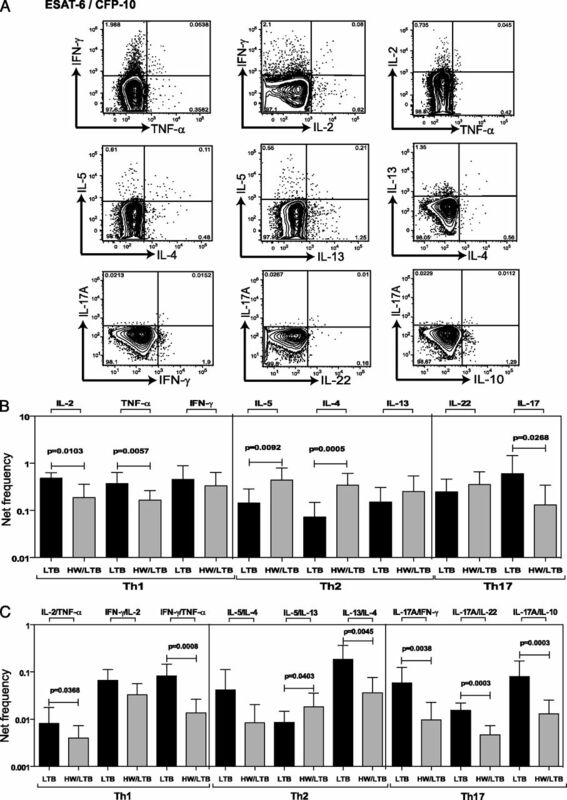 Human type 1 and 17 responses in latent tuberculosis are modulated by coincident filarial infection through cytotoxic T lymphocyte antigen-4 and programmed death-1. J. Infect. Dis. 200: 288–298.
. 2009. Attenuation of Toll-like receptor expression and function in latent tuberculosis by coexistent filarial infection with restoration following antifilarial chemotherapy. PLoS Negl. Trop. Dis. 3: e489.
. 2007. Chronic helminth infections may negatively influence immunity against tuberculosis and other diseases of public health importance. Expert Rev. Anti Infect. Ther. 5: 475–484.
. 2007. Intestinal helminth co-infection has a negative impact on both anti-Mycobacterium tuberculosis immunity and clinical response to tuberculosis therapy. Clin. Exp. Immunol. 147: 45–52.
. 2006. Are intestinal helminths risk factors for developing active tuberculosis? Trop. Med. Int. Health 11: 551–558.
. 2006. Schistosoma mansoni, nematode infections, and progression to active tuberculosis among HIV-1-infected Ugandans. Am. J. Trop. Med. Hyg. 74: 819–825.
. 2008. The biological functions of T helper 17 cell effector cytokines in inflammation. Immunity 28: 454–467.
. 2012. Human Th17 subsets. Eur. J. Immunol. 42: 2215–2220. 2007. Th2 cytokines in susceptibility to tuberculosis. Curr. Mol. Med. 7: 327–337.
. 2007. T helper 2 cytokines inhibit autophagic control of intracellular Mycobacterium tuberculosis. Immunity 27: 505–517.
. 2010. Polyfunctional T cells in human tuberculosis. Eur. J. Immunol. 40: 2139–2142.
. 2008. Detection of polyfunctional Mycobacterium tuberculosis-specific T cells and association with viral load in HIV-1-infected persons. J. Infect. Dis. 197: 990–999.
. 2011. Diversity and dialogue in immunity to helminths. Nat. Rev. Immunol. 11: 375–388.
. 2011. Induction of CD4+CD25+FOXP3+ regulatory T cells during human hookworm infection modulates antigen-mediated lymphocyte proliferation. PLoS Negl. Trop. Dis. 5: e1383.
. 2006. Regulatory networks induced by live parasites impair both Th1 and Th2 pathways in patent lymphatic filariasis: implications for parasite persistence. J. Immunol. 176: 3248–3256.
. 2006. Regulatory T cells induced by parasites and the modulation of allergic responses. Chem. Immunol. Allergy 90: 176–195.